I promise to make a video of this soon, but a number of you have asked for instructions on greasing the Hensley Hitch Ball. 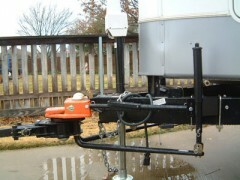 It’s fairly simple and doesn’t require you to lift the hitch head. 1. Hook up to your trailer. Lock the over-center latches but leave everything else unhooked. Leave the tongue jack down. 2. Unlatch the coupler from the hitch ball. 3. Loosen the strut bars until they’re sloppy loose (if you forget to do this, the struts will hold the ball tight against the coupler and you’ll never get it unhooked). 4. Raise the trailer tongue as if you were unhooking from a standard ball hitch. The coupler should lift off the ball. If it doesn’t come off, loosen the struts more or remove them altogether. If that still doesn’t work, you probably have some rust or dirt in the coupler. Get some WD-40 or rust penetration spray and spray up into the coupler. It will work free. If you lube the ball once a year, you should never have this problem. 5. Once the coupler is free, raise it up until you have room to work on the ball. You can pull the tow vehicle forward if you’d like more room. 6. Clean the ball and inside the coupler. Try to get any dirt or rust out of the coupler. 7. Now grease the ball. Any automotive grease will do. Be generous. You can’t over-grease. Use a rag to wipe it inside the coupler as well. 8. That’s it. Now lower the coupler back onto the ball, lock the latch. Many owners actually put a lock through the coupler latch to prevent theft of their Hensley Hitch. Just don’t lose the key! 9. Tighten the struts again. Remember: they should be even on both sides (count the threads) and just tight enough so that the struts don’t rattle when you try to shake them. Check your struts after the next time you tow, they may loosen as the ball settles back into the coupler. 10. That’s all there is to it! Shoot for once a year with this. Thought the ball doesn’t move much inside the coupler with the Hensley Hitch, it does rotate up and down. If it sits for years without lubing, the coupler may rust and damage the ball.